Hopelessly Devoted Bibliophile: The LOVE IS LOUDER campaign, and your chance to win a copy of SPEECHLESS by Hannah Harrington! 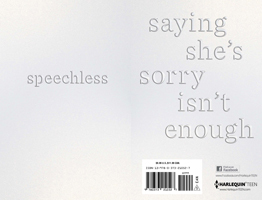 The LOVE IS LOUDER campaign, and your chance to win a copy of SPEECHLESS by Hannah Harrington! As promised, today is all about the Love is Louder campaign! As you may have read earlier this week, this is a campaign that Harlequin Teen and Speechless are promoting. In my opinion, it's a worthy cause! Let me share some more. 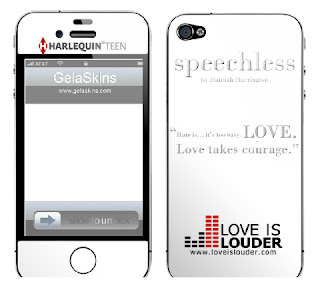 Harlequin TEEN has partnered with the nonprofit Love is Louder, a movement that started when actress Brittany Snow, MTV and the Jed Foundation decided to do something to help those feeling mistreated. Hundreds of thousands of people just like you have come together to raise the volume around the message that love and support are louder than any internal or external voice that brings you down. Everyone knows that Chelsea Knot can’t keep a secret. Until now. Because the last secret she shared turned her into a social outcast – and nearly got someone killed. Chelsea has taken a vow of silence – to learn to keep her mouth shut and to stop hurting anyone else. Speechless explores the real-life teen issues of bullying, mean girls, LGBT awareness and hate crimes. Compared to the many books already out about bullies, Harrington’s novel stands out for its authentic voice and unflinching portrayal of what it means to be part of the bullying. In October 2012, Harlequin TEEN will be releasing a brand new survey that has interviewed 1,500 girls between 13-18 years old on the subject of bullying. See my review of Speechless! As part of this promotion, Harlequin Teen is giving away prize packs at blogs like mine! One lucky winner will win a Love is Louder gel phone skin, as well as a copy of Speechless! Open to U.S. and Canada Only. To enter, fill out the Rafflecopter form below! Giveaway ends 9/25/12.